Imagine getting a crash course in how to make silver jewelry. Check out this earring tutorial and see if it doesn't make metalworking and wire-wrapping seem as easy as pie. This is a beginner to intermediate tutorial. If you've had some experience making jewelry, but want start getting into metalwork, this is a great starting point. 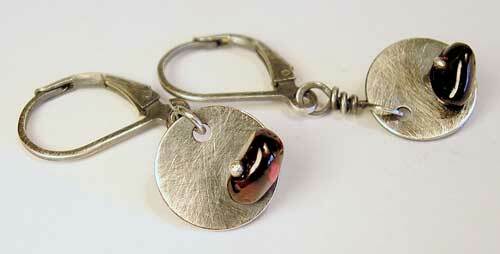 You'll pierce, wire-wrap, oxidize, ball silver with a torch (optional), and create a brushed patina (also optional). The hardest part of this gorgeous project is finding the cash to buy all the tools, and finding a jewelry supply to get them from. If you already have the tools, this project will be a cake-walk.